Theodore Roosevelt McElroy (1901–1963) was an extraordinary man. 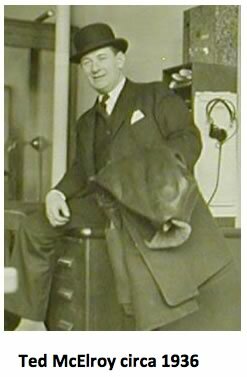 Won the title of World’s Champion Radio Telegrapher at age 20. 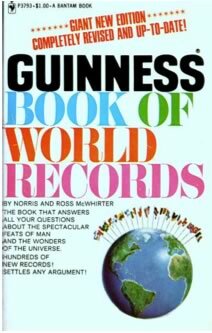 Achieved recognition in the Guinness Book of World Records. Received a ceremonial Key to the City of Boston. Built a multimillion dollar manufacturing business starting from his kitchen table. Won the prestigious Army-Navy “E” Award for excellence from the US Defense Department. Made headlines by overseeing a group interested in buying the Brooklyn Dodgers. Had a mountain in the Antarctic named in his honor. 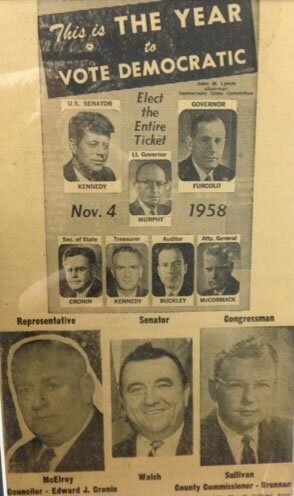 Ran for political office in 1956 on the same ticket as President John F. Kennedy. Born to Irish Catholic parents in 1901 in Somerville, MA, Ted was the third of six children. Ted’s Irish mother, Catherine was said to be demanding and had high expectations for each of her children. Education was considered an important element of the McElroy household. Yet Ted would achieve success with only a 6th grade education. Most of his brothers, were all Harvard educated, Including his older brother Jack, who later became a rear Admiral in the US Navy. Ted’s dad, Charles, worked as an accountant for the Boston & Maine Railroad. While attending Forster Grammar School in Somerville, he took a class in typing and excelled. He later said that his mother would insist that he practice typing for some three hours a day. His proficiency in typing––in speed, accuracy, and spelling––would give him an acute advantage over other operators in the telegraph field, which was then coming of age. When Ted was about 12 years old, he found employment selling newspapers after school. At age 14 he set his sights on employment at Western Union, intrigued, no doubt, by those messenger clerks on bicycles (provided by Western Union). While in the Western Union main office between deliveries, the old-time operators showed the young boy how to operate telegraph keys and were astounded to discover his typing speed and accuracy. It was the beginning of the Roaring Twenties. While many young folks were learning the Charleston, Ted McElroy was working long hours pounding code as a wireless operator for RCA in Chatham, MA. He had an amazing ability to receive Morse code, which was the primary means of long-distance communication in the world at the time. He kept at it for a year or so, but Ted longed to be back home in Boston. The Boston Western Union office was delighted to have him back. A contest was scheduled on May 6, 1922, for telegraph code speed and accuracy at Mechanics Hall in Boston. Western Union’s “golden boy” telegraph operator Ted McElroy brought home the trophy. They backed a winner at 51½ words per minute, and “T.R. 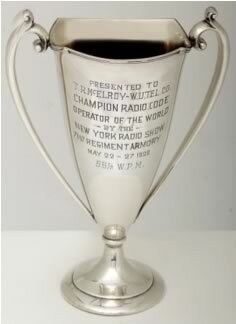 McElroy” was inscribed on the Silver cup of the Boston Radio Exposition. Just 2½ months later, August 2, 1922, it now was “on to Chicago and let’s win there.” At stake was the George E. Carlson Trophy. The champion took home the gold- and diamond-encrusted medal after a triumphant 56 words a minute. It was said that after the contest some 20 minutes later McElroy copied code at a remarkable 70 words per minute for an astonishing 5 minutes. The Key to the City is bestowed upon distinguished persons and honored guests of a city. In 1933 famed Mayor James Michael Curley presented Ted with the Key to the City of Boston in recognition of his achievement as the World’s Fastest Telegrapher. It was a significant time for him for he was off to Chicago to defend his title at the 1933 World’s Fair. Sicut patribus sit deus nobis civitatis regimine donata A.D. 1822. The highest recorded speed at which anyone has received Morse code is 75.2 words per minute––over 17 symbols per second. This was achieved by Ted R. McElroy (U.S.) in a tournament at Ashville, North Carolina, on July 2, 1939. His record has never been beaten. And remember, “receiving” meant typing the message on a manual typewriter. Grandpa was a lickety-split typist. 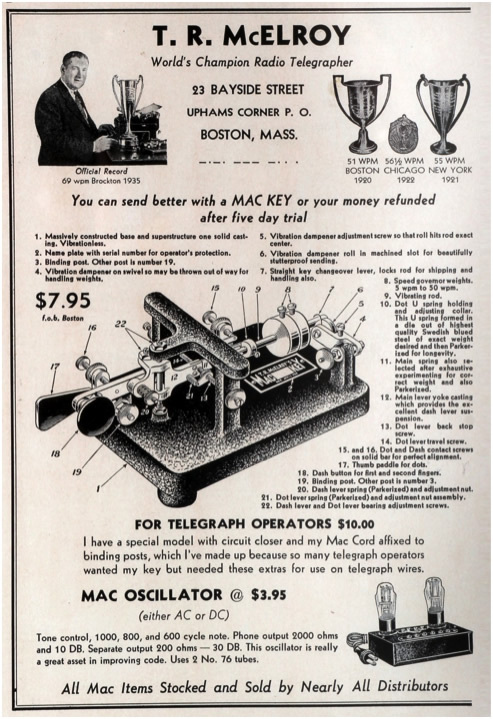 Ted parlayed his status as world champion telegraphers to manufacture and market his own brand of telegraph keys. He began the business at his kitchen table at 23 Bayside Street Dorchester a historic neighborhood in Boston, MA in 1936. Ted’s Boston factory, located on Brookline Avenue was across the street from Fenway Park home of the Boston Red Sox. . He soon became the largest manufacturer of high-speed automatic radio telegraph equipment in the world. The Morse line included everything from the old-fashioned hand key to state-of-the-art high-speed wireless communications equipment for all branches of the armed services. Four years later, as reported by the Boston Traveler newspaper his business was grossing over $5 million in sales. That’s over $60 million in today’s money. This was quite an accomplishment for a man with only a grammar school education. 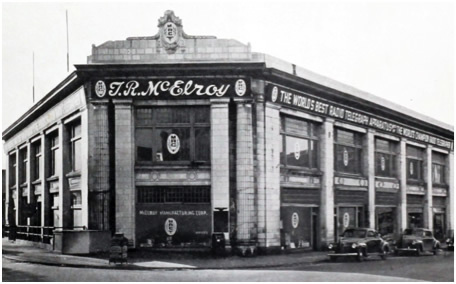 McElroy Manufacturing went on to win the coveted Army-Navy “E” Award for its valuable contribution to our victory in World War II. 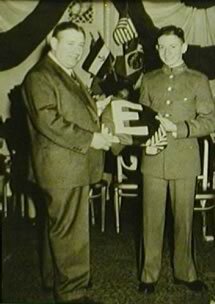 The Army-Navy “E” Award was an honor presented to a company during World War II for excellence in production of war equipment. Although all factories engaged in war production were eligible to receive the award, less than 5% of the companies involved in war work received this honor. Ted and the employees were honored at the hotel Kenmore in Boston, by the Govenor Saltinstall and Senator David Walsh. The radio broadcast of the ceremony was heard from coast to coast. Click here to hear the audio of the Army Navy E Award Presentation. He sold his business in 1956 and settled into a sort of “semi-retirement,” but it didn’t last long. He started another business as a Manufacturer’s Representative. He founded T.R. McElroy & Associates and utilized his contacts from his prior business to broker agreements for the sale of goods & services. In 1958 and again in 1960, Grandpa ran for State Representative from the 12th Middlesex District. He was on the same Democratic ticket as John F. Kennedy. Unfortunately, he was unable to unseat longtime Republican State Representative and former insurance broker Chester H. Waterous. Who gets a mountain named after them? I never realized it when I was younger, but it’s a pretty cool thing to have a mountain named after you. And that’s another thing that happened to Grandpa. Mount McElroy is a prominent mountain at the west end of the Hutton Mountains, in southeastern Palmer Land, Antarctica. 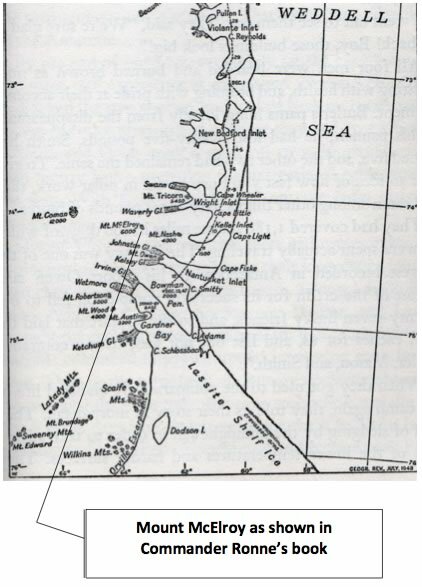 It was discovered and named by the Ronne Antarctic Research Expedition in 1947–1948 led by Commander Finn Ronne, USNR. 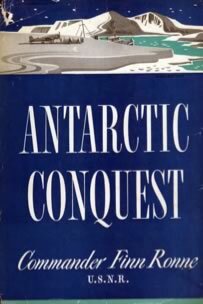 The details of the expedition were published by New York publishing house G. P. Putnam’s Sons in 1949. 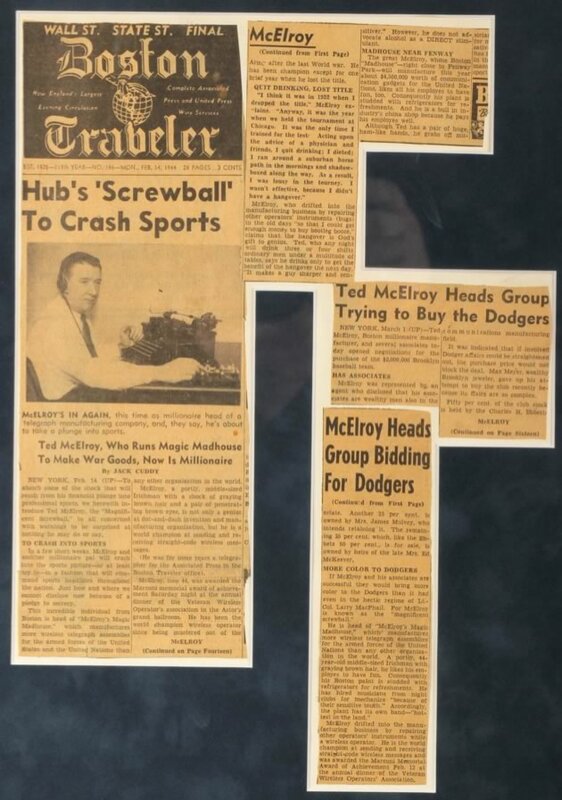 Newspapers across the country headlined the story of T. R. McElroy and the Brooklyn Dodger sale……..
Have you ever dreamed of owning a Major League Baseball team? What if you had the opportunity to bid on such a storied franchise as the Brooklyn Dodgers? In the spring of 1944, Ted and a Chicago associate made headlines by revealing their interest in purchasing a controlling interest in the ball club. But Grandpa had serious insider competition. The team was owned by the heirs of Charles Hercules Ebbets (credited with inventing the concept of the “rain check” and of proposing a player draft favoring teams that finished low in the standings) and the heirs of his partners, Ed and Stephen McKeever. He had financed the building of Ebbets Field in 1912 by selling half his shares in the team to the McKeevers. Ebbets died of heart failure in 1925. His wife and daughter inherited his shares. The McKeever brothers’ shares were inherited by Stephen McKeever’s daughter, Dearie, and her husband, James Mulvey. But alas, effective control was in the hands of Brooklyn Trust Company, to which the heirs owed more than half a million dollars. It seems that the second-generation owners couldn’t agree on much; and the combination of the Great Depression as well as poor team performance were beginning to take a toll. In the 1930s the bank moved to protect its investment. George V. McLaughlin, President of Brooklyn Trust Company, took control of the Dodgers and brought in Walter O’Malley to run the team. O’Malley went onto the Board of Directors of the Dodgers as a lawyer (in 1932), but he actually represented the interests of the bank. After the 1942 season, O’Malley hired the legendary Branch Rickey as the club president. Rickey is best known for breaking Major League Baseball’s color barrier by signing African American player Jackie Robinson; for drafting the first Afro-Hispanic superstar, Roberto Clemente; for creating the framework for the modern Minor League farm system; and for introducing the batting helmet. How the Brooklyn Dodgers finally got sold. A deal was finally struck in the fall of 1944. O’Malley joined with Rickey and Andrew Schmitz, a prominent Brooklyn insurance executive, to purchase 25% of the stock from the Ed McKeever estate. In the second transaction, on August 13, 1945, O’Malley, Rickey, and Smith purchased an additional 50% of the shares of stock after a nearly yearlong effort. Reportedly, the stock deals cost $240,000 for the first purchase and $800,000 for the second, a total of $1,040,000 for 75% ownership. It was also reported that Grandpa’s group was willing to invest up to $1,500,000 for controlling interest. But they didn’t have a chance. Looks like the sale was the proverbial “inside job”!